Since 2003, Ugo Rondinone has created several series of masks that began on the wall and later morphed into large-scale figures. The 12-part group “moonrise. East” are each titled January to December and represent the progress of the year, while the main title of the group refers to the rise of the moon, the start of night and the western sky. Each Sculpture is a disembodied head set atop a plinth of old, weathered wood. 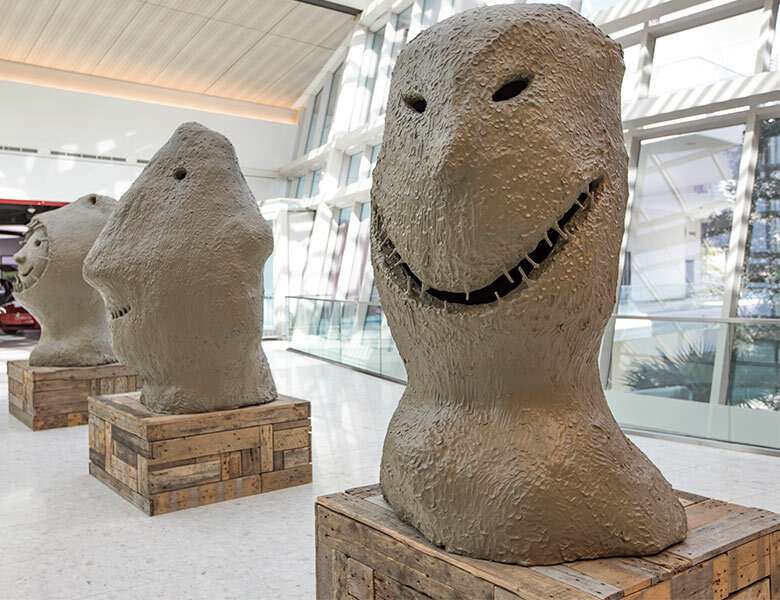 These pieces are the artist’s first free-standing figurative sculptures, conceived in 2005, and represent the fourth and final group in a series of masks entitled Moonrise. The process of creation is still visible; the giant sculptures with finger-stroked surfaces were modeled in brown clay then cast in aluminum and lacquered to match the color of the original material.